Day 2– (10 Mar, 2018, Saturday) – Arrive Delhi: You will be met on arrival and transfer to our hotel near Airport. Overnight at The Pride or Hilton Garden Inn for the night. Day 3 – (11 Mar, 2018, Sunday) – Delhi-Leh (3500 m): In the morning transfer to airport to connect a direct flight to Leh. You will be met on arrival and transfer to the hotel. Rest of the day is to relax or enjoy a leisurely walk around Leh market. Evening enjoy dinner with the Snow Leopard team and briefing about your tour. Overnight at Hotel Golden Dragon or similar for 3 nights. Day 4 – (12 Mar, 2018, Monday) – Leh ( around 3500 m): Visit to Shanti stupa and monasteries in Shey, Thiksey and Hemis. Also visit local market. Day 5 – (13 Mar, 2018, Tuesday) – Leh – Zinchan – Husing (around 3700 m): Drive to Zingchan (around 1 hour drive) and then trek to Husing ( 02-03 hours). This is the entry point to Rumbak Valley and the home of the Snow Leopard. Overnight in a tented camp/homestay. Day 6 to 8 – (14 – 16 Mar, 2018, Wednesday – Friday) – Husing( around 3700 m – can trek upto 4500 m depending on sighting): Today you trek into the interiors of Snow Leopard country. You will trek from here to Husing where you have your first camp the opportunity to be interacting with the locals of the area and gain a good insight into their culture. Your sighting may include birds like Lammergeier, Golden Eagle, Chukar, White-winged Redstart, Himalayan Snowcock, Yellow-billed and Red-billed Choughs, Robin Accentor, Horned Lark, Tibetan Snowfinch, or maybe a Eurasian Eagle Owl and a few other species. Some of mammals you may spot are Blue Sheep (Bharal), Mountain Weasel, Red Fox, Stone Marten and if lucky Royal Pika on a warm day. Overnight stay in a tented camp/homestay. 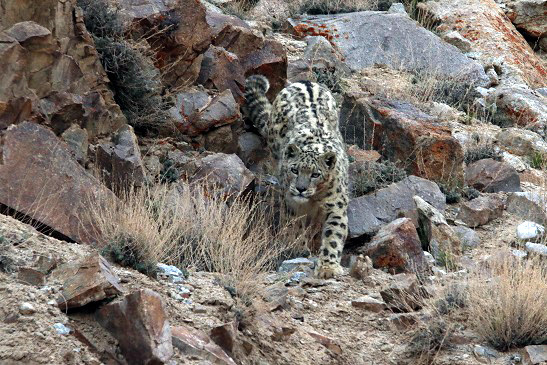 Day 9 to 11 – (17-19 Mar, 2018, Saturday – Monday) – Rumbak (around 4000m – 4500 m): Today we move to “ Rumbak Doh” where will explore the area on foot (trekking and walking) with our guides to try and spot the Snow Leopard. We will also have the opportunity to look for other animals and high altitude birds and also get enthralling insights into local folklore, as well as learn about their customs and traditions. Part from the high altitude birds you will try to look for Asiatic Ibex, Ladakh Urial and Tibetan Argali also known as Great Tibetan Sheep and Tibetan Wolf. Overnight stay in a tented camp/homestay. 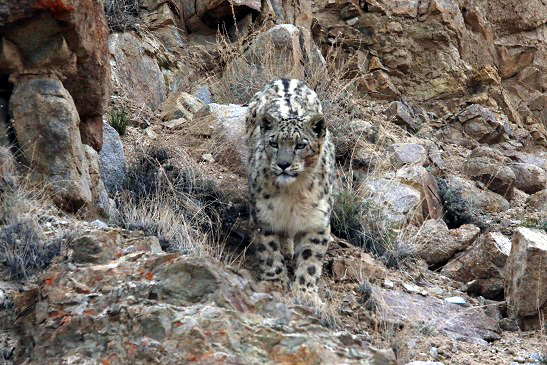 Day 12 to 14 – (2o-22 Mar, 2018, Tuesday-Thursday) – Uley (around 3700 m): We move now back to Husing and then drive down and hike to to Uley where we spend our final 03 days for watching Snow Leopard and its prey. We may also sight Asiatic Ibex, Ladhak Urial and Tibetan Wolf. Birds that can be locally sighted are Great Rosefinch, Brown Dipper and White-winged Redstart. Overnight stay in a tented camp/homestay. Day 16 – (24 Mar, 2018, Saturday) – Leh –Delhi: Today you will be transferred to Leh airport to fly back to Delhi in the morning. Overnight at The Pride or Hilton Garden Inn. -Items of personal nature such as tips, Insurance, laundry, phone calls etc. Camping out in the extremes of Ladakh is not the most luxurious, yet it is a means to an end and we aim to make it as comfortable as possible during your snow leopard tracking expedition. We will provide you stay in good quality Alpine Tents (crawl –in, 02 People Tents) or simple Homestays (if required). If interested, please get in touch with us and we will send you complete details of the tour like detailed information on Camping, Weather and items to bring on the tour.